As I sit in my unseasonably warm home, and turn on Desert Island Disc from Recess Monkey, I am swept away to the Ocean. The songs are all desert related and the instruments like cello, fluegelhorn, ukulele add to the great sound of tropical music. explore all the aspects of island life. This CD was fun for the kids and myself! Oh to be on a tropical island. If you can't travel, you may as well enjoy great music to go with your imagination. My 9 year old daughter loved this CD. The music forces you to move your body and dance to the music! You can't get through it without tapping your toes and smiling big! In a down mood? Pop in this CD for a great lift me up! Winding down from the high energy of its June 2013 release, Deep Sea Diver, Recess Monkey longed for a calmer second act. Fortunately, tranquility was soon to be had, following a bit of drama when the "Tambourine Submarine" from Deep Sea Diver crashed onto the rocks of a deserted island. To while away the hours while stranded in their newfound tropical paradise, Recess Monkey created Desert Island Disc, which features acoustic instruments conveying the relaxed, sun-drenched pace of good friends exploring a strange new land together. Graced with elegant and colorful orchestrations by Jherek Bischoff, Desert Island Disc is like the calm exhale following a rampaging storm of summer excitement. Notes Recess Monkey's Jack Forman, "After the electrified excitement of Deep Sea Diver, we wanted to explore the calmer side of our songs, and what better place than on a remote beach? Desert Island Disc ended up being played with instruments only available on an island: strange, pieced together drums, acoustic textures, and waves genty lapping on the shore." Adds Drew Holloway, "We conceived Desert Island Disc not only as a companion to Deep Sea Diver, but also as its counterpoint. Desert Island Disc is an experimental album for us, but the songs are still sequenced in a flow that gives an arc to the record. Our intent is always to link together songs in a way that transports people to another place." 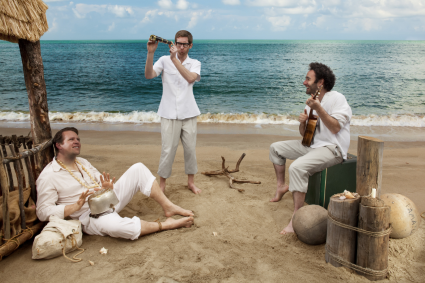 Desert Island Disc picks up on our inveterate explorers with their discovery of the "Coconut Radio" as it tunes in on the nostalgia of bygone times, with the warmth of its string orchestrations setting the mood and holding the entire album together. 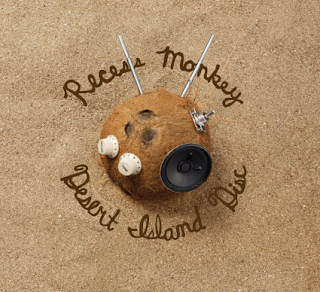 Using this "radio," Recess Monkey is able, one song at a time, to dial into a variety of enchanting and mysterious activities that populate the island. Highlights include "The Hermit," in which hermit crabs humorously execute a crabby conga as they scurry from one seashell domicile to another, and "Pearls of Wisdom," a funny exposition of well-worn sayings that adults seem to be unable to resist offering to kids. This is followed by "The Cave," an equally hilarious duet, in which Drew Holloway meets a mountain of resistance from guest vocalist Dean Jones when attempting to sign him up for an extremely scary cave adventure. Guest artists on Desert Island Disc include Justin Lansing of the GRAMMY winning Okee Dokee Brothers (banjo), Dean Jones of Dog on Fleas (vocals), Johnny Bregar (B3 organ), and Sam Bischoff (saxophone). The album was actually recorded on an island -- Bainbridge Island, Washington -- in Johnny Bregar's Brickyard Studios. Nine Recess Monkey songs have reached #1 on the Sirius/XM Kids Place Live chart. Sirius/XM's Kids Place Live Program Director Mindy Thomas declared, "These guys are able to tap into elementary school so well that it's like they never left. In this never-ending nationwide talent show of kid and family music, they are most definitely at the top." Time Magazine celebrated Recess Monkey's "tight, smart, acclaimed original songs ... and seriously grooving funk." Enthused The Washington Post, "These guys put the 'fun' in funky. (Just try to keep your feet from moving!)" Explained kids' music authority Stefan Shepherd (Zooglobble.com), "Recess Monkey just keeps turning out album after album with pop nuggets, as if we'd just discovered that The Beatles had recorded a ton of kids' music 40+ years ago." Desert Island Disc will be available at recessmonkey.com, amazon.com, cdbaby.com, theAVCafe.com, bigkids.com, iTunes, bandcamp.com, Silver Platters, Sonic Boom Records, and Barnes & Noble.